The main highlight for me was the presentation by Athabasca University Press about their first two years as an open access publisher. Frits Pannekoek, president of Athabasca University, delivered excellent opening remarks for the panel. His ideas and enthusiasm for opening access to education and learning from scholarly institutions was inspiring and refreshing. What would the Canadian university system look like today if other university presidents thought like Dr. Pannekoek? Two years ago, AUP launched as an open access academic publisher offering journals, monographs, and websites (very interesting and exciting idea). 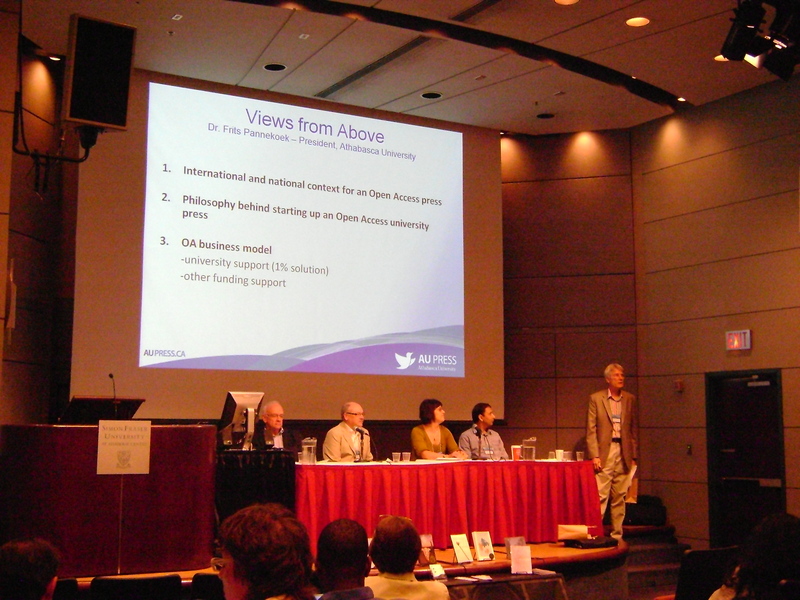 As Walter Hildebrandt, director of AUP, made clear in his presentation, the open access publishing movement is not about either online/free or print/pay. AUP has demonstrated in just two years that a university press can successfully publish both digital and print scholarly monographs in an open access model, using Creative Commons licensing. Their collection of books already includes award-winning books like Sarah Carter’s The Importance of Being Monogamous: Marriage and Nation Building in Western Canada in 1915. The work of AUP over the past two years is impressive and will likely begin to reshape the scholarly publishing landscape in Canada for Canadian and environmental historians. With established, senior historians like Sarah Carter and others moving in this direction toward open access publishing, it will help build the credibility and reputation of publishers like AUP. Also, if you’re interested in following this conference as it happens, I encourage readers to watch some of the live-streaming video and the work of the army of live-bloggers from PKP.